Light, ethereal Pavlova is one of my favorite desserts. Originating in New Zealand, this dream of a dessert was invented for the ballerina, Anna Pavlova on her visit in the 1920’s. This fact is hotly contested by the Australians, and there is no doubt Pavlova is a beloved dessert in the Antipodean countries! A well-loved dessert in South Africa too, this showstopper of a dessert often graced our table at holidays and birthdays growing up. Here I showcase my mother’s recipe, which is the perfect balance of crispy on the outside and chewy within. Of course, one is left with egg yolks from this recipe, perfect for making Crème Pâtissière to accompany the Pavlova. To compliment the Saffron Pavlova, this version of Crème Pâtissière is infused with chai spices and orange oil. This seemingly simple dessert is prey to many pitfalls, resulting in collapsed, cracked or grainy meringue and lumpy pastry cream. In this post, we will visit the key steps needed for show-stopping Pavlova success! First off, the selection of eggs; I am so spoiled in my local community to have access to the freshest, truly pasture raised eggs. Organic eggs are a great choice too. Be sure that that are as fresh as possible if you are unsure of how to check the freshness of the eggs or which to choose, read here. Although eggs are edible for quite some time when they are freshly laid, they are slightly acidic and as they age, they become more alkaline, especially the white of the egg. The egg white then becomes runny as the proteins begin to repel each other instead of holding together. One would still be able to whip up the eggs, however, they would not be as stable as when using fresh eggs. When separating the eggs, be sure that absolutely no egg yolk makes it into the egg white, as this will ruin your chances of whipping up a meringue cloud. It is best to crack each egg individually into a small dish; if one egg breaks you haven’t ruined the whole batch! Cold eggs are easier to separate, however, room temperature egg whites whip up easier and to greater volume. Separate the eggs while cold and allow the egg whites to rest at room temperature for a half hour or so before whipping. While it is tempting to try and reduce the sugar, in this case, the sugar is needed to keep the meringue aloft and bake into a crispy delight. The texture of sugar is important – the finer the grain, the glossier and smoother the meringue. Most recipes call for castor sugar; I make my own by grinding organic unbleached sugar in the food processor. For this recipe, I ground my saffron spice with the sugar to ensure even distribution. Clean, clean, clean! Be sure that all pieces have been well washed and dried with no greasy residue. There is no faster why to deflate a meringue than a bowl or whisk with a trace of a previous dish. For this reason, I always use a disposable or dedicated piping bag, one that has been previously used for a cream-based recipe may appear clean but can spell disaster! Disposable piping bags tend to be quite small; my simple trick is to use a gallon-sized zip lock bag, cut a tiny slit across a bottom corner and pop the pastry nozzle through. Secure it by wrapping tape around the nozzle, up to the top edge. 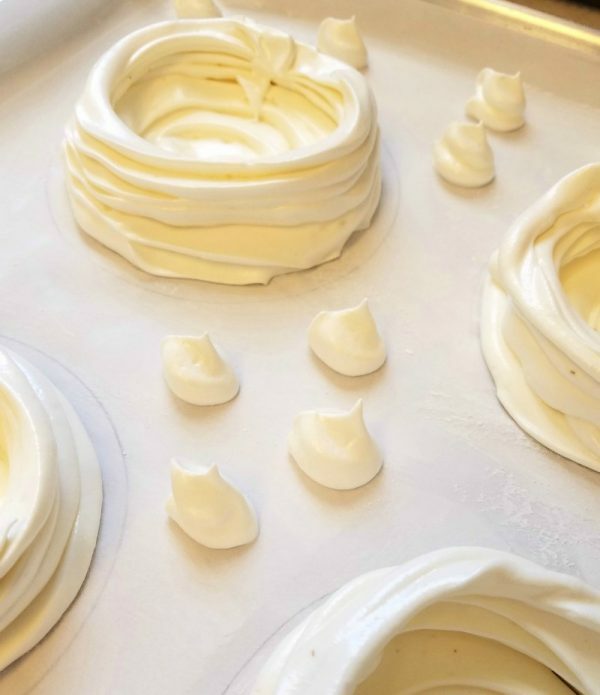 To really appreciate the process here, let’s take a peek at the science of meringue. Egg white consists of protein (amino acids) and water, like long beads on a string. Some of these ‘beads’ are hydrophilic, meaning attracted to water, and some are hydrophobic, meaning repelled by water. In egg white, these hydrophobic ‘beads’ are folded up hidden away from the water. Whipping the egg begins the process of forcing air into the molecules, allowing the proteins to unfold, trapping air bubbles, and forming a larger network. Introducing an acid, such as vinegar or lemon juice, to egg whites that are beaten just to a light foamy consistency, increases the bonding surface and allows for a larger yield. Once the egg whites gain volume, but are not yet stiff, introduce the sugar a little at a time, this allows the sugar to interact with the water, stiffening up and stabilizing the molecules. Beat until the meringue holds soft peaks, but is not stiff and dry. Once the meringue holds soft peaks it is ready. 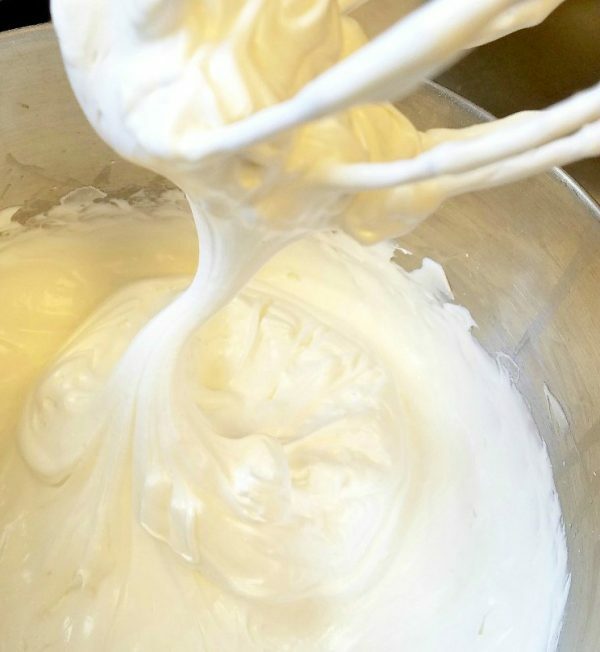 When the meringue is baked, heat causes the air bubbles to expand, the water to evaporate, and the proteins to stiffen up. 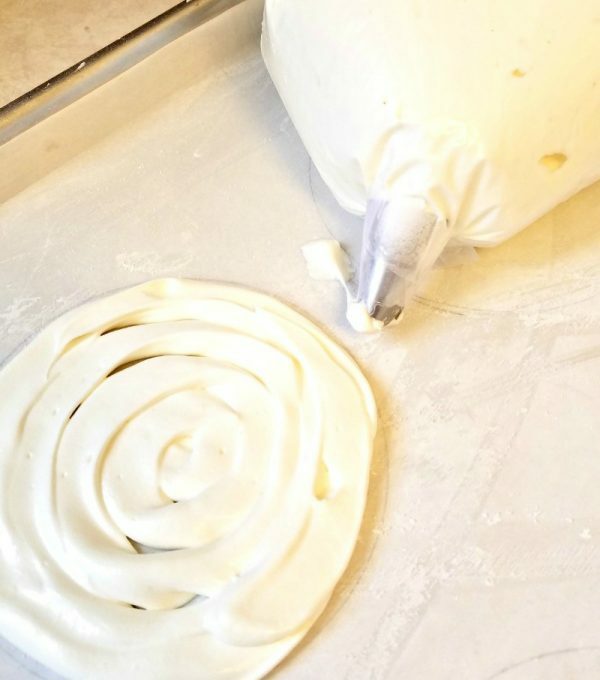 Keep this in mind when piping or spooning out your meringue, allow for a little expansion. And lastly, keep an eye on the weather! Humid days can cause the sugar in the meringue to absorb more moisture, resulting in beading on the meringue. Stabilizers such as cornstarch, cream of tartar, or tapioca starch are generally used to help hold the structure together. I have sidestepped this problem in my yacht chef days in the steamy Bahamas by adding a little more stabilizer to the recipe. Prepare the piping bag with the nozzle of choice. Prepare the baking sheet; measure out parchment paper to fit the baking sheet. Use a bowl or small plate to trace out the shapes for individual Pavlova’s or a large dinner plate for a larger one. Turn the paper over and paint each circle lightly with ghee, sprinkle tapioca starch over, and shake off excess. This preparation is the best way to ensure the meringue does not stick to the paper. Grind the sugar, tapioca starch, cream of tartar, and saffron together in a food processor until it is finely ground. 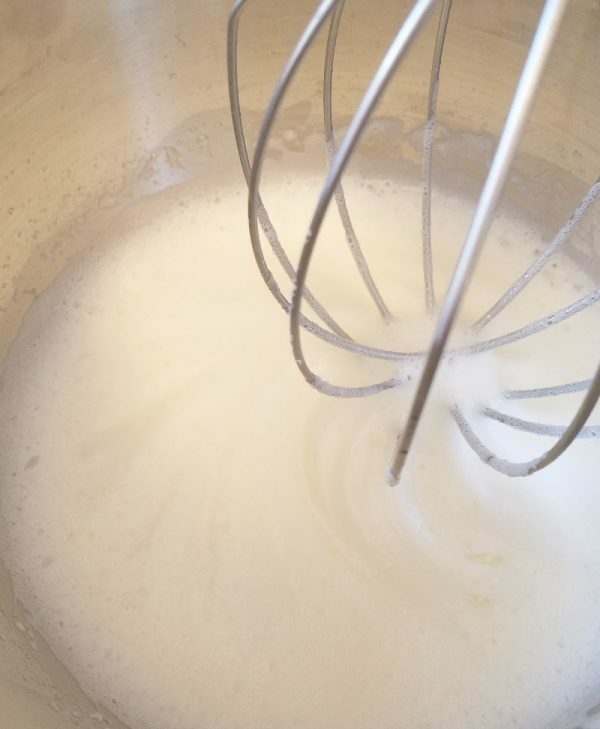 Place the egg whites in a standing mixer and whip until foamy. Add the vinegar and whip until beginning to firm up, but not yet forms stiff peaks. With the machine running on low, add the sugar mixture one spoonful at a time. Whip glossy and stiff peaks, do not overbeat. Fill the piping bag and beginning in the center of the circle, pipe a spiral pattern, building up the sides to form a bowl. Don’t worry if they aren’t perfect, once topped with fruit and filling they look fabulous! If you have extra filling, you could pipe smaller meringues for decoration. Begin piping a spiral from the center. Build up the sides of the Pavlova to form bowls. Omit the vanilla bean from the original recipe and infuse the milk with 1/4 teaspoon chai spice and one drop orange essential oil. Peel the mangoes and slice thinly. Cut each slice into thin ribbons until you have about six ribbons for each dessert. Place the remainder of the mango in a blender. Segment the oranges and set aside around five segments per dessert. Squeeze the remainder of the juice into the blender and blend to a puree, adding more juice as needed. Add a dash of chai spice to taste. 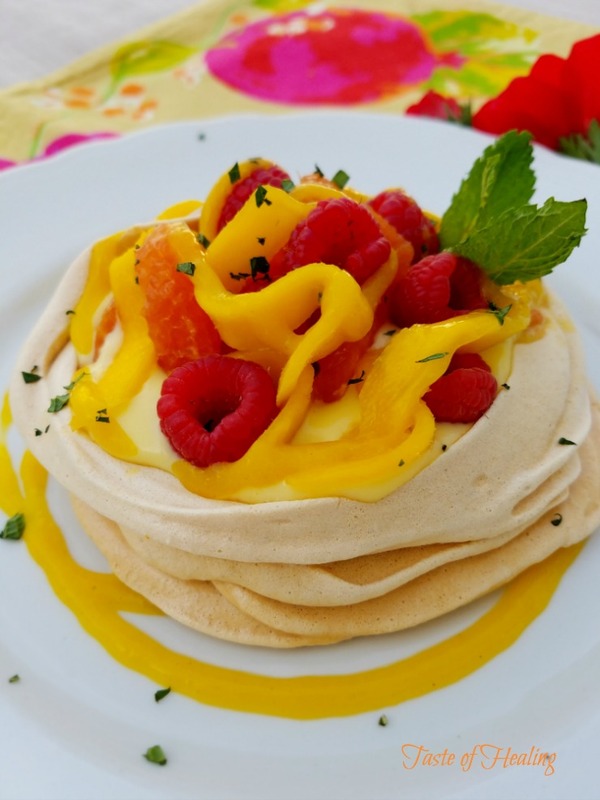 To assemble the dessert: fill each Pavlova with Crème Pâtissière and top with the orange segments and mango ribbons creatively placed and curled along with the raspberries. Squeeze the mango puree around the plate and a little on top of the dessert. Finish off with a mint sprig. I don’t see how long to cook it for. Hi Sage! I am so sorry! I don’t know how that last step got missed, but we have updated the recipe now. You’ll want to bake for one hour and 15 minutes at 350F. Do not open the oven door during baking, at the end of the bake time turn off the oven and allow the meringues to cool completely and dry out (this takes about four hours). Thank you for letting me know it was missing.